It was a beautiful fall day when I passed through the gates for probably the 45th time on my nearly annual pilgrimage to The Eastern States Exposition. At least that’s what it was called when I was growing up. Since then marketers have shortened it to The Big E.
The Big E is a huge state fair, except it encompasses all five New England states. This is the first year I went alone. Gratefully alone. No negotiating with friends or family about whether to listen to the presentation on sheep shearing (I vote yes), or enjoy seeing the pride on the young people’s faces as they compete for ribbons and bragging rights for their well-groomed cows (a must), or talk with the volunteer historical interpreters in the authentic village square called Storrowtown Village (that’s another yes for me! ), or whether to eat the clam fritters in the Rhode Island building, the apple pie in the Vermont building, or the lobster roll in the Maine building (yes, yes, yes). This year I got to do whatever I wanted, for as long as I wanted. And what I love best is being curious. I actually didn’t plan to turn my trip to the Big E into newsletter writing assignment. But with so many interesting entrepreneurs and lifestyles all around me, I couldn’t help myself. Here’s what I learned, and how my curiosity can help you to change course. I learned that… 80 percent of the lamb that is sold (and therefore eaten) in the United States happens along the eastern seaboard states from Washington, DC north to New England. What that tells me is that, unless you are a vegetarian, there is an opportunity to creatively work with the various state sheep councils to encourage chefs in other parts of the country to put lamb on the menu. I also learned there is a demand for sheep shearers to service smaller farm operations like Greenwood. Time magazine even did an article last February on the effort to train more shearers. And, according to Tom, some of the best shearers are women. Lesson: It is amazing what you can find out if you just talk to people. What would you want to ask Tom that I didn’t? She’s grown from a small stand to selling her tomatoes at three Whole Foods stores (two in West Hartford and one in Glastonbury), at the famous Stew Leonards chain in Connecticut and New York, and with more chains and outlets in the works. Are you curious how Marybeth landed these major accounts? I was. Are you ready? She asked, and the store manager said yes. Lesson: Speak up. Ask questions. Talk to people about what you do… or hope to do. The door to opportunity opens when you open your mouth. What would you want to ask Marybeth that I didn’t? From the Blue Heron Soap booth, I learned that, like a lot of businesses, this one was born out of necessity. Owner Peggy Manthei’s daughter had sensitive skin. Her search for a solution led to tinkering with her own soaps and years later Peggy and husband Carl continue to make all the soaps personally. Money questions can be a little more delicate but my curiosity got the best of me. “Is it really profitable to truck all this soap from Minnesota for a 3 week fair in Massachusetts?” I asked. The young man grinned from ear to ear and said simply, “We get $6 a bar.” Enough said. Obviously the fair circuit is an effective marketing strategy. According to the show schedule on their web site, this year alone they’ll be in North Carolina, Chicago, Tennessee, South Dakota, and elsewhere. Lesson: When you think about marketing your product or service, do a cost-benefit analysis. If your marketing investment is $1,000 but you have the chance to make $2,000, then you’re ahead of the game. What would you ask the people at Blue Heron Soap that I didn’t? From the young man at the Annie’s Pooch Pops All Natural Dog Treats booth, I learned that a business you might assume to be local and/or online exclusively actually has quite a mobile marketing strategy. Between Annie, her son, or her son’s friend, they sell at over 200 of these kind of fairs and shows a year! Lesson: Starting any business requires sacrifice and hard work. Period. Ask yourself. “What do I love enough to work that hard to grow?” What would you want to ask Annie and her team that I didn’t? There were also a few surprises at the Big E. For example, also in the Connecticut building was a guy selling something you would not normally expect among the alpaca socks and maple syrup vendors. But there was Kirk Sinclair along side a stack of his books, Systems Out of Balance: How Misinformation Hurts the Middle Class. According to his business card, Kirk is a “Middle Class Advocate, Social Systems Analyst, and Rabble Rousing Bard.” He’s also the token middle-aged guy in a rock band that plays at local colleges. I have not read Kirk’s book (but plan to), but after I met him, I recalled that last year I bought a book at the same fair from a woman who’d traced the history of her Native American grandmother. Lesson: Being an entrepreneur means sometimes showing up in surprising places. Where can you show up? What about offering piano lessons at the farmer’s market or negotiating with a local clothing or paint store to conduct puppy training demonstration a well-blocked off section of their parking lot? The great thing about visiting the same booths year after year is you get to see what’s changed. The fact that a vendor is back itself tells you the investment in time and money was worthwhile. Case in point, last year I helped myself to a free sample of Kathie Rosenschein’s SuperSeedz Pumpkin Seeds (yum!). My family was not as keen on my curious mind, but I managed to chat long enough to find out that this mother of five’s business was starting to take off. When I went back this year I discovered Kathie had started selling her gourmet pumpkin seeds on QVC! If you place an order, I highly recommend the curry flavor. Even if you don’t buy, check out Kathie’s first stint on national television talking about her product on QVC. In a past life, I delivered a few seminars at QVC headquarters in Pennsylvania and got to talk to the product evaluators. What I learned was that it’s not that hard for even small business owners like Kathie – or you – to get product on their network or on the Shopping Network. Lesson: Stick with it and great things can happen and never assume you’re too small. Have you ever been curious about what it would be like to sit down with one of the most successful entrepreneurs of all time… a living legend? I am. So, as a select few of you already know, a few days ago I plunked down 5 figures (gulp!) 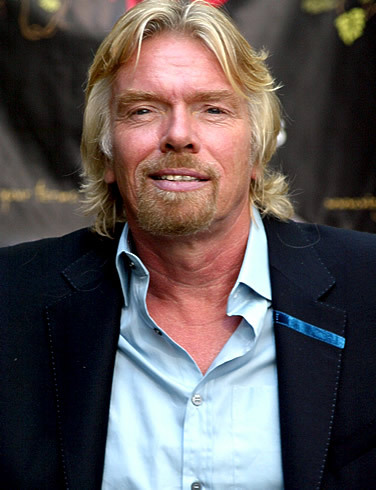 to grab one of only 10 spots in a private brainstorming session with Sir Richard Branson! Yes, THAT Sir Richard Branson – the billionaire founder of Virgin Records, Virgin Airlines, and numerous other Virgin enterprises. Why would I spend such an outrageous sum of money simply to satisfy my curiosity? Good question since money alone does not impress me. If it were Donald Trump, as interesting as that would be, at that price, I’d pass. What DOES impress me is that, like me, Richard Branson is a passionate social entrepreneur. Not only will I get to pick the brain of one of the most brilliant entrepreneurs on the planet, but my entire $10k will go to support not one, but two amazing organizations. A few hours after the brainstorming session I’ll be heading to the annual Rock the Kazba fundraising gala. For some cool videos of last year’s big gala click here. The Eve Branson Foundation seeks to improve the lives of women and girls in the Atlas Mountains of Morocco by providing the tools they need to create marketable goods – and thus become economically self-sufficient. Her organization is part of Virgin Unite which harnesses global resources and entrepreneurial energy so that business becomes a force for good. What I especially love about this organization is the emphasis addressing both social and environmental problems and on helping disadvantaged youth to develop and launch businesses. I plan to pick his brain about how best to bring the message of turning passions into profits to a larger, potentially global audience. The time is so ripe for this message of hope. I think the same can be said for dreams. Most people have dreams that are too small for their spirit. Your dreams need to be as big and as powerful as you are. That means learning to think bigger about your work, your life, and your gifts. Simply said, I want you to want more both for yourself and for all those you touch. You and I are on the cusp of an incredibly exciting movement! It’s a movement where job placement and career counselors are starting to understand that the old ways aren’t working. It’s no longer enough to push people into accounting or engineering or pharmaceutical sales. People today want more. They want to find ways to turn their passion for cooking or sports or travel or art or healthy living into a viable way to make a living via a small business. Richard Branson has plans to reach out to disadvantaged youth in the United States. So I’m thinking there may just be a way for the people who have gone through my Outside the Box/Passions into Profits Training Program to get involved somehow. To be perfectly clear, I have no idea what’s going to happen when I meet Sir Richard Branson. After all, I haven’t even met the man! But hey, an hour earlier I was making a poached egg. Suddenly I’m booking airfare to LA to meet with a billionaire social entrepreneur! You never know what can happen when you are curious, when you dream big, and when you honor your dreams with action. On a more serious note, while there’s no connection to Branson’s organization, Lisa passed along this inspiring story of a desperately poor 14 year boy from Malawi whose curious mind led him to figure out how to build a windmill from trash. William Kamkwamba did not speak or read English. Instead, he relied on the pictures in library book to guide him. Being curious will change your world. As young William reminds us, being curious can change the world for the better as well. In the next 24 hours, I challenge you ask at least one small business owner at least one question. Then post your question (and the answer) at the Changing Course blog so we can all grow from your curiosity! P.S. Have questions for Valerie about the NEW “Passions into Profits” Coach Training coming up soon? Email them to [email protected]. Great post Valerie. I started to look at what marketing lessons can be learned from street beggars (a lot in my view). If anyone is interested the post is at http://snipurl.com/sjele. I think we can all learn a great deal by observing the world and the people around us and then thinking what this could tell us about how to or how not to do business. Great newsletter! I love how you link curiosity to success. Lately I have been thinking about aging of society and all the “stuff” folks have to unload as they simplify. I have seen people obsess over a closet full of what ppears to be junk to me. I am curious as to whether I could help them and their families make this a less emotional effort. And inspired by your link to trickle up, I wonder if linking their unloading to others benefit might make this easier for them. Thanks! me again ! I think that’s a brilliant idea Durley although I suspect older people cling to things because oftimes it’s all they have left and things can be their memories of the life they pne lived. Now me, I have a closet full of stuff and I don’t get rid of it for the simple reason that charities don’t always give clothes to those who need but send perfectly usable ones to factories fo shredding and recycling. They get paid for it but it doesn’t clothe the needy.